Join Us at Movie Night! 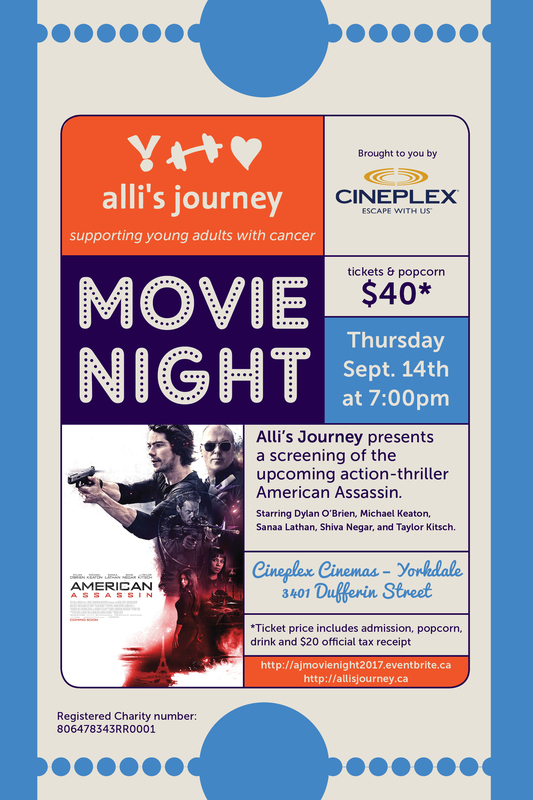 Alli’s Journey, with the support of Cineplex, is excited to announce the 2017 edition of our Movie Night: a pre-release screening of the action-thriller, American Assassin. American Assassin is directed by Michael Cuesta and is based on Vince Flynn’s 2010 novel of the same name. It stars Dylan O’Brien, Michael Keaton, Sanaa Lathan, Shiva Negar, and Taylor Kitsch. Mark Thursday September 14th in your calendars and purchase your tickets now! On the night, registration will begin from 6:45, theatre doors will open from 7:15pm with the screening beginning at 7:30pm. Each ticket is $40 and includes the film, a popcorn and drink and an official tax receipt for $20. Proceeds from ticket sales and additional purchases will go towards our Comfort Bag program as well as other, new and exciting initiatives. There are a limited number of seats available, so be sure to get them as soon as you can. For those of you who may be unable to join (whether our local or international friends), your generosity through donations would also be greatly appreciated either via the Alli’s Journey main page or directly via Canada Helps. All donations are eligible for an official Canada Revenue tax receipt in the full donated amount. We’re extremely excited to be hosting this event and look forward to connecting with you all at the movies! There are many options for transport to the event. Cineplex Cinemas Yorkdale is located at the north-east corner of Yorkdale (Hwy 401 and Allen Rd/Dufferin) and is connected to the TTC at Yorkdale Station (on Line 1). There is also ample parking at the mall. Kindly contact us via the Event Organizer link below. Certainly, we appreciate that sometimes plans change and thet you might not be able to attend the event but still wish some to use your ticket. Simply give them the ticket for entry. Each ticket can only be used once and will be scanned at the entrance to the event. When purchasing a ticket, you should receive an email with an electronic version of your ticket (including a bar-code). Kindly print this, or bring on your mobile device, for entry to the event. Upon entry, you will be provided with your vouchers for your popcorn and a drink (one each per ticket purchased). This is alright as we will simply be tracking the attendees through scanning their tickets upon entry. This does mean however, that copying the tickets is not permissable as once a ticket has been used for entry, a second version of the same ticket will be refused entry.